Looking for a green place to hang out and chill at in the heart of the city? Welcome to the Viktoriapark, where artists, barbecuers and musicians frequently meet to hang out, as it is located right next to Mehringdamm, one of Berlins most (in)famous streets. The park is also home to one of Berlin’s highest hills, the Kreuzberg, which gave the district its name. Hey, they even grow a local wine there, the so-called “Kreuz-Neroberger”. I remember many quiet and relaxed nights on the Kreuzberg where I had a barbecue with my friends, someone was playing guitar and later we left for a party from there. The best day in the year to come here is undoubtedly when the famous “Karneval der Kulturen” is on: Every summer the whole city seems to meet in the Viktoriapark to chill and just have a good time. 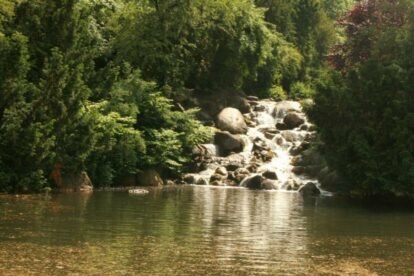 The highlight of the park is a beautiful waterfall that just drops down the whole Kreuzberg – put your feet in the water and just enjoy the spectacular view over the city you have from there. The only night you should probably avoid going there is on the 1st of May, as Kreuzberg sadly still is home to the infamous riots as well – but things have gotten way better over the past years. Anyway, just enjoy your time in one of Berlin’s green lungs and eat a steak for me while you’re there.